The table is booked! Our April meeting takes place in Grayshott on Wednesday 12th at the Gurkha Durbar. Aperitifs will be at the Fox and Pelican from about 19:30, and then dinner is booked for 20:30 just up the road. The Gurkha Durbar focuses on Nepalese food and has some delicacies that you don't find so often elsewhere, including choila, the delicious char-grilled lamb starter. We need to give the restaurant as good an estimate of numbers as possible by Tuesday but an early reply is very helpful. Note - this is a Wednesday booking, our first of the year, instead of the Tuesdays that we've been 'trying out' increasingly often since mid 2015. Please reply to the e-mail notice sent to members or use the feedback form on our web site. There's lots of parking in Grayshott including at the F&P, and three public car parks, as well as on the street. 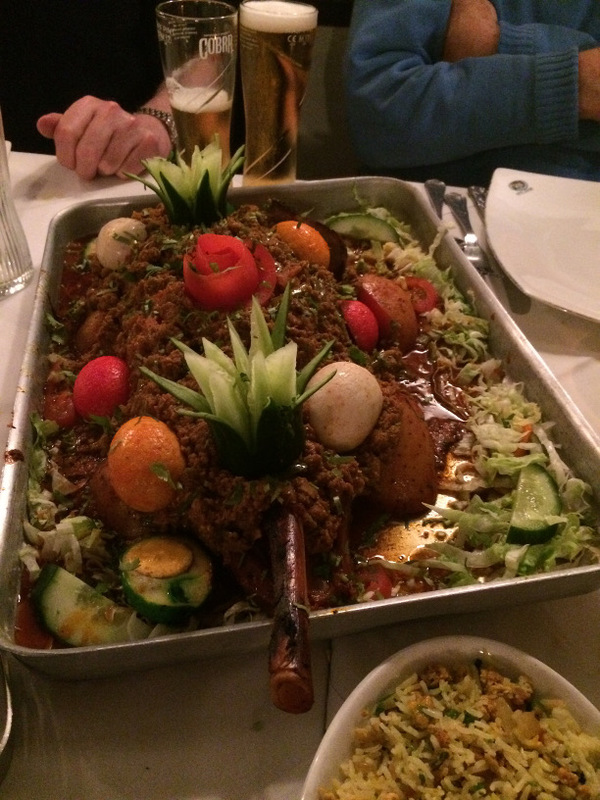 A little report from our foray to Spice Lounge: the kulchi lamb was exceptional; the picture on the right gives an idea of the impressive presentation of the second leg that arrived after the first had been demolished. We again thought the spicy version of kulchi lamb was tremendous - just enough to tickle the taste buds and make it a delicious variant on what can otherwise seem a little bland. We'd had some late drop-outs, and there was too much for seven of us to eat; some of us had doggy bags to take away. I can testify that the cold lamb made delicious lunchtime sandwiches for the rest of the week and also went extremely well with couscous for supper one evening. They earned a Good review on TripAdvisor - well deserved. Looking forward to a great evening on Wednesday 12th!